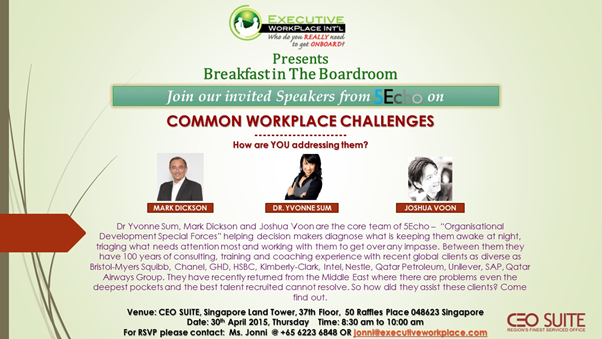 COMMON WORKPLACE CHALLENGES: How are YOU addressing them? 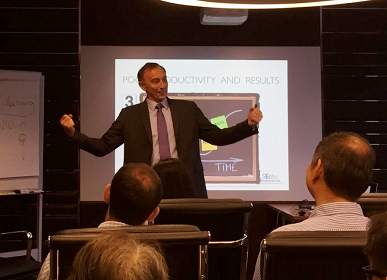 Dr Yvonne Sum, Mark Dickson and Joshua Voon are the core team of 5Echo – “Organisational Development Special Forces” helping decision makers diagnose what is keeping them awake at night, triaging what needs attention most and working with them to get over any impasse. Between them they have 100 years of consulting, training and coaching experience with recent global clients as diverse as Bristol-Myers Squibb, Chanel, GHD, HSBC, Kimberly-Clark, Intel, Nestle, Qatar Petroleum, Unilever, SAP, Qatar Airways Group. They have recently returned from the Middle East where there are problems even the deepest pockets and the best talent recruited cannot resolve. So how did they assist these clients? Come find out. Be prepared to share your most pressing leadership challenge and let Team 5Echo help you work to breakthrough it. Learning & Development solutions have been the panacea for a lot of ‘chronic ailments’ in people & change management at the moment. Particularly Coaching. Team 5Echo will give a brief overview of when this is the solution and when not. If so, how do you overcome your challenge and make the results stick? Come and find out. Executive WorkPlace International is an executive search and recruitment firm specialising in the search of key technical, professional and managerial positions. We take time to understand our candidates’ talents and experiences for the assignment of critical positions in your company.